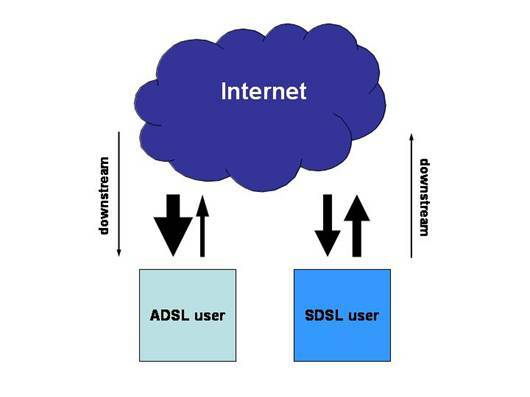 The prime difference between ‘SDSL’ and ‘ADSL’ is the speed of transmission in the ‘downstream’ direction (the direction from the network towards the user) – relative to the speed of transmission in the ‘upstream’ direction (te direction from the user towards the network). In SDSL the transmission rate in downstream and upstream directions is the same (i.e. symmetric). In ADSL, the downstream rate of transmission is greater than the upstream bitrate (i.e. asymmetric). The commonest form of DSL is ADSL. 4 VDSL (very high speed digital subscriber line) is able to operate at very high speed (e.g. up to 50 Mbit/s) over copper cable – but only over short distances. Typically VDSL is used in ‘hybrid’ networks, comprising short copper cable connections from VDSL customer premises to locally placed street cabinets and then by means of glass fibre to the network operator’s exchange building site (this type of hybrid network is sometimes referred to as ‘fibre-to-the-curb’ (FTTC)).